Increasing definition of stereo image...? Greetings from a noobie who's been limited to simple static EQs in Audacity for years, and got put onto TDR Nova just a few days ago! I'm greatly impressed by Nova (GE), and I'm still finding out what, out of all the changes I'd like to make in various of my recordings (mostly natural soundscape), are realistic expectations for Nova or/and other plugins with related functions to be able to do. One particular thing that I guess probably wouldn't be doable to a useful extent but would make a big positive difference for me would be to be able to increase the definition of all detail in a stereo image, so that each detail is more precisely located. For my first few years of recording natural soundscapes I was using a Sony PCM-M10 recorder, which had remarkably accurate sound for such a small and inexpensive device, but my switching over in 2016 to the PCM-D100 made me realize how much room for improvement there was in the M10 soundstage. It would be very nice if I were able to reprocess some of those recordings to make them more like the D100 recordings - much wider soundstage and much sharper definition. Now, I'm aware that I can widen the stereo image using Proximity, but the only problem about doing that on its own is that the widening just further blurs the details. So, first, the real need if I'm to get a reasonably lifelike wider stereo image is to get the image sharpened up first. -- But so far I've not come across anything that would achieve that for me. I guess that this would have to remain just a dream for me, but can any nice person here point me to a means if such does exist? -- Many thanks! Re: Increasing definition of stereo image...? 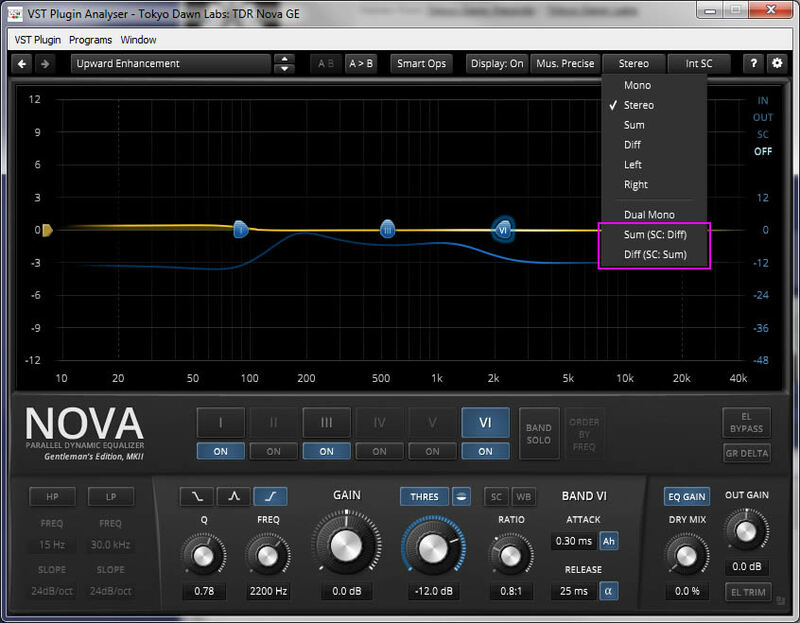 What about boosting the high-end in NOVA while using the Diff channel? It's basic stereo widening by using mid-side processing. Here's a NovaGE example for a broadcast oriented dynamic stereo widener. It's made of two overlapping bands, one low mid bell and a very large high-shelf, each widening only if the SUM is large. <TDRNovaGE bandSelected_1="Off" bandActive_1="Off" bandGain_1="0.0" bandQ_1="0.50" bandFreq_1="50" bandType_1="Bell" bandSCQ_1="0.50" bandSCFreq_1="50" bandSCType_1="Linked" bandDynDirection_1="Above T" bandDynLookahead_1="Off" bandDynActive_1="Off" bandDynThreshold_1="0.0" bandDynRatio_1="2.0" bandDynSplit_1="On" bandDynAttack_1="20" bandDynReleaseType_1="Dynamic" bandDynRelease_1="200"
bandSelected_2="Off" bandActive_2="Off" bandGain_2="0.0" bandQ_2="0.60" bandFreq_2="120" bandType_2="Bell" bandSCQ_2="0.60" bandSCFreq_2="120" bandSCType_2="Linked" bandDynDirection_2="Above T" bandDynLookahead_2="Off" bandDynActive_2="Off" bandDynThreshold_2="0.0" bandDynRatio_2="2.0" bandDynSplit_2="On" bandDynAttack_2="10.0" bandDynReleaseType_2="Dynamic" bandDynRelease_2="180"
bandSelected_3="Off" bandActive_3="On" bandGain_3="0.0" bandQ_3="0.64" bandFreq_3="63" bandType_3="High S" bandSCQ_3="0.40" bandSCFreq_3="72" bandSCType_3="Linked" bandDynDirection_3="Above T" bandDynLookahead_3="On" bandDynActive_3="On" bandDynThreshold_3="-3.0" bandDynRatio_3="0.8" bandDynSplit_3="On" bandDynAttack_3="1.00" bandDynReleaseType_3="Dynamic" bandDynRelease_3="180"
bandSelected_4="Off" bandActive_4="On" bandGain_4="0.0" bandQ_4="0.10" bandFreq_4="230" bandType_4="Bell" bandSCQ_4="0.60" bandSCFreq_4="340" bandSCType_4="Linked" bandDynDirection_4="Above T" bandDynLookahead_4="On" bandDynActive_4="On" bandDynThreshold_4="-1.0" bandDynRatio_4="0.9" bandDynSplit_4="On" bandDynAttack_4="2.0" bandDynReleaseType_4="Dynamic" bandDynRelease_4="300"
bandSelected_5="Off" bandActive_5="Off" bandGain_5="0.0" bandQ_5="0.41" bandFreq_5="3200" bandType_5="Bell" bandSCQ_5="0.41" bandSCFreq_5="3200" bandSCType_5="Linked" bandDynDirection_5="Above T" bandDynLookahead_5="Off" bandDynActive_5="Off" bandDynThreshold_5="0.0" bandDynRatio_5="2.0" bandDynSplit_5="On" bandDynAttack_5="2.0" bandDynReleaseType_5="Dynamic" bandDynRelease_5="50"
bandSelected_6="Off" bandActive_6="Off" bandGain_6="0.0" bandQ_6="1.07" bandFreq_6="6000" bandType_6="High S" bandSCQ_6="1.07" bandSCFreq_6="6000" bandSCType_6="Linked" bandDynDirection_6="Above T" bandDynLookahead_6="Off" bandDynActive_6="Off" bandDynThreshold_6="0.0" bandDynRatio_6="2.0" bandDynSplit_6="On" bandDynAttack_6="1.00" bandDynReleaseType_6="Dynamic" bandDynRelease_6="25"
hpSelected_master="Off" hpActive_master="Off" hpFreq_master="15" hpType_master="24dB/oct" lpSelected_master="Off" lpActive_master="Off" lpFreq_master="30000" lpType_master="24dB/oct"
bandGain_wide="0.0" bandDynActive_wide="Off" bandDynThreshold_wide="0.0" bandDynRatio_wide="1.5" bandDynAttack_wide="5.0" bandDynDirection_wide="Above T" bandDynLookahead_wide="On" bandDynReleaseType_wide="Dynamic" bandDynRelease_wide="148"
I've got to attend to some other things over the next day or so, so will have to come back to this to get my head around implementing this. I'm not clear at the moment how one goes about using the sc:sum and sc:diff channel settings, but will have to come back to this little adventure after my little escapade in the meantime, hopefully with a fresher mind! Really nice to know we have such helpful people here! Now the monkey's back, with another 10+ hours of recordings of early spring bird panoramas in the Teign Gorge, now dusted over with TDR Nova for reducing mic wind noise to a low enough level that I'd need to cut out only a small number of wind gusts - and that achieved with less wind protection than was necessary previously. It does indeed appear that TDR is getting me much more in command of where and when I can usefully record now, and so this is all quite exciting for me. Anyway, thanks again for the pointers and the preset for stereo widening. I've now experimented just a bit, and it does seem that I can very much improve the imaging of the PCM-M10's recordings - though it'll take some experimentation yet to be sure I've found an optimal configuration before I let loose a stereo sharpening / widening preset on all my PCM-M10 recordings - and in the meantime I have other, higher priority tasks. I do have some other challenging EQ issues to ask about, but will post about those in new threads in due course - you've been warned! I've experimented further, and found that I get the most effective and easily-achieved stereo sharpening and widening using not Nova (rather a sledgehammer to crack a nut for this issue), but by the Proximity plugin. That's also enabled me quickly to include the various Proximity effects for setting the soundstage back just a little, because widening the soundstage otherwise makes everything sound a bit too up-front and 'in your face'. I've saved a custom preset that seems to be optimally effective for all types of recording done on my old PCM-M10s, and have started working through my recordings made with that model, using that custom stereo-widening preset in Proximity, and the positive change in each recording is quite breathtaking, having achieved my goal of getting these recordings to sound as near as possible to what I get from the PCM-D100, with not only a much better soundstage width but also the sharpness and clarity of each detail. - And I'd been imagining that it would be an unrealizable 'holy grail', to get such definition as well as a wider soundstage! - Absolutely brilliant, and I'm greaty excited and chuffed now to be able to transform all those old recordings so! -- Thank you yet again, Fabien, for such fantastic software! Post the Proximity preset, would love to see/hear it! Sorry about delay in coming back here. Indeed I'll post some details that I guess would be extremely useful for some people, but am holding back at the moment as I'm still exploring and finding what I can and can't do using the plugins, and in what situations. It's turning out that there's a bit more to it than just using a Proximity custom preset for stereo widening, but I'll post about that shortly, probably in a new thread. Let's just say now that I'm truly thrilled at the clear and lifelike soundstages I'm routinely getting from my old PCM-M10 recordings as I'm working through them now - so much so that I'm bringing into active service (alongside the D100s) my original M10, and indeed am on the lookout for one or even two more of that model (would have to be second-hand, sadly, as that model is fairly long discontinued now).